I contributed to the cyber-clutter by posting over at the Mackids blog. 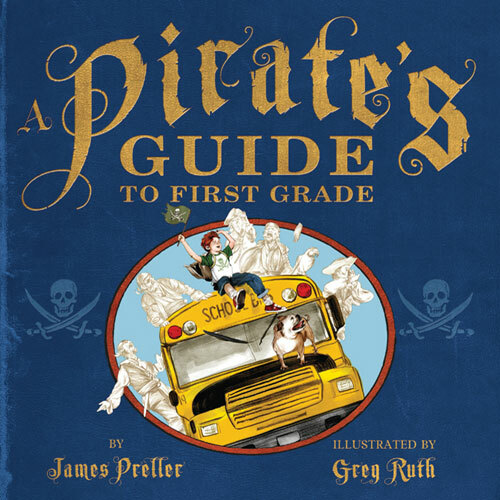 Kathryn Hurley had asked me to write something about A Pirate’s Guide to First Grade. I mulled that over for a week or so, and came up with this, below. Funny, in clipping it and pasting it here, I decided to ditch the first paragraph. That happens a lot with writing. You scribble and scribble, then realize that the story starts why down in the fourth paragraph. It would have been faster to start there in the first place, but I suppose you’ve got to go through the process of getting there . . . I have vivid memories of playing alone as a little boy, the youngest of seven children. Inspired by “Batman” and “The Wild, Wild West,” I used to create epic battles in my living room. I’d fight imaginary villains, hurl myself headlong into the cushions, throw wild left hooks into the air, crash the bad guys’ heads together like coconuts. Likewise, I’d often go outside to pitch a rubber baseball against the shed behind my house. I’d imagine myself as a big league pitcher going up against the great hitters of my time: Willie Mays, Hank Aaron, Roberto Clemente and more. And here’s the thing: There was always an internal narrative going on in my head. “Two outs, bases loaded . . .” I’d mumble to myself, setting the scene. I didn’t realize it at the time, but I was telling myself stories, inhabiting an imaginary world, learning how to write. This made me, of course, no different from any other kid I’ve ever met. These days, I’ll look out the window and see my son out by the pool, waving his arms, lips moving, telling himself some kind of story. It seems like it’s a fundamental aspect of being a kid, living in that imaginary world of our own making. Maybe that’s why we dream, I don’t know. Maybe it’s necessary. So when it came to writing A PIRATE’S GUIDE TO FIRST GRADE, I think I was drawing on those memories of being a boy, a head full of imaginings. The boy in the book thinks about pirates. They are alive to him, and as he goes through the day they remain vital in his mind. The narrative itself isn’t much, a fairly uneventful first day at school –- with story hour and lunch and recess and a trip to the library. But I like the creative core of this book, the hard truth of a boy’s imaginings, the story in his head. For an author, it’s a magical experience when an illustrator breathes new life into the manuscript, adds color to that black-and-white page. I’m blessed that Greg Ruth did such an amazing job with this story. But then again, Greg was a kid once, and somehow he still has that map that allows him to return to that creative place of the mind, a boy making things up. Maybe that’s the treasure to this job after all, where X marks the spot and we find ourselves alone in a room, lips moving.